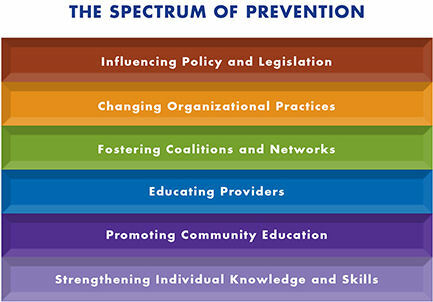 Substance Use and Misuse Prevention in Marin County includes effective prevention strategies outlined in the Prevention Institute’s Spectrum of Prevention Model and the prevention plan for the County is based on the Substance Abuse and Mental Health Services Administration’s (SAMHSA) Strategic Prevention Framework. Marin County’s Substance Use Prevention Programs are in place to reduce the harm associated with alcohol or drug use in the County and reduce the incidence and impact of substance use and misuse by offering a series of services that promote healthy life choices. Marin County and its contracted providers and community partners work together through the Marin Prevention Network (MPN). As evidenced by the Spectrum of Prevention, Community Coalitions are proven effective in achieving primary prevention outcomes. Throughout the County of Marin and through the Marin Prevention Network, community members in collaboration with Marin County Department of Health and Human Services staff seek to change community norms, policies, and laws that affect the availability, promotion, sale, and use of alcohol and other drugs to create a community environment that promotes healthy choices and reduces risk. 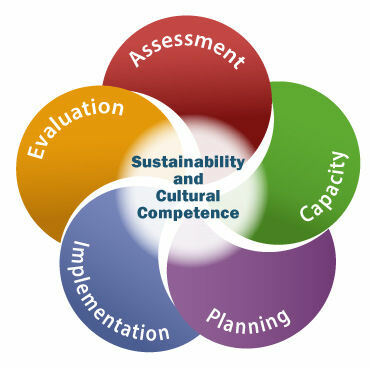 Develop priorities, policies, plans, and promote services which are responsive to community needs. Provide access to a comprehensive array of quality, culturally competent, and cost-effective Alcohol and Other Drug prevention, treatment, outreach and education programs.